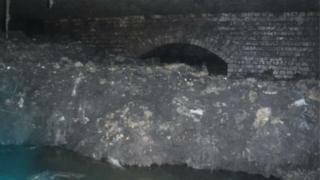 A 210ft (64m) chunk of congealed fat - known as a fatberg - found in the sewers of a seaside town has been removed. The big "beast", made of solid fat, wet wipes and grease, was discovered under The Esplanade in Sidmouth in December. South West Water (SWW) said the fatberg was the biggest it had seen and took nearly eight weeks to remove. The water provider said 36 tanker loads of debris, each containing 3,000 gallons, were excavated by its team. "Workers have braved exceptionally challenging conditions to break up the beast," SWW said. "They had to be winched into the sewer via a manhole, and for the first few days needed to wear full breathing apparatus because of dangerous gases in the pipe." Image caption South West Water said the fatberg "had made headlines around the world"
Clearance teams used pick-axes and high-pressure jets to clear the cumbersome chunk. Once broken down into a manageable consistency, the fat was sucked up a pipe into tankers waiting on the surface. It was then taken to a plant that turns waste into electricity to be processed. SWW asked people not to "pour fats, oil or grease down the drain, or flush wet-wipes down the loo". Andrew Roantree, from the firm, said: "The Sidmouth fatberg is the largest discovered in our service history, and illustrates how this key environmental issue is not just facing the UK's biggest cities but our coastal towns as well. "The fatberg has made headlines all over the world, and we really hope that this will help everyone to remember to only flush the 3Ps - pee, paper and poo - down the loo."